In the screenshot, the value zero marks the expiry date of the account as indicated. The yellow slider represents when the renewal invoice is to be generated. 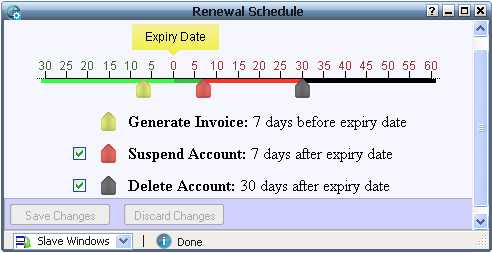 In the screenshot, it is shown indicating that the invoice is to be generated 7 days before account expiry. The slider can be dragged to the extreme left to set values more than 30 days before account expiry. In that case, a textbox shows up to enter the number of days. Invoices must be generated sufficiently before the expiry date so as to give the customer enough time to pay. We recommend the Generate Invoice slider be set to at least 3 days before expiry date. The red slider represents when the account is to be suspended. In the screenshot, it is shown indicating that the account is to be suspended 7 days after account expiry. The slider can be dragged to the extreme right to set values more than 60 days after account expiry. In that case, a textbox shows up to enter the number of days. You can use the checkbox next to the Suspend Account text to indicate that accounts should never be suspended. Suspend account days should be as close to the expiry date as possible to prevent your customer from using your service for long durations without paying. However, it should not be so short that if a payment fails, the customer has no time to manually rectify the problem and make the payment. We recommend the Suspend Account slider be set between 2 and 7 days after expiry date. The black slider represents when the account is to be deleted. In the screenshot, it is shown indicating that the account is to be deleted 30 days after account expiry. The slider can be dragged to the extreme right to set values more than 60 days after account expiry. In that case, a textbox shows up to enter the number of days. You can use the checkbox next to the Delete Account text to indicate that accounts should never be deleted. Once the system deletes an account, all data including HTML files, images, databases, emails, etc related to that account will be deleted off the WHM/cPanel server. You can only recover the data from backups you might have taken. The account is only marked as deleted within PawBill, though.